When you read the title you probably think what the hell am I talking about? Ever seen a donkey doing a roly poly on dusty yellow sand? That is how the name of this sweet cake came from. I think the name is really cute and sweet. 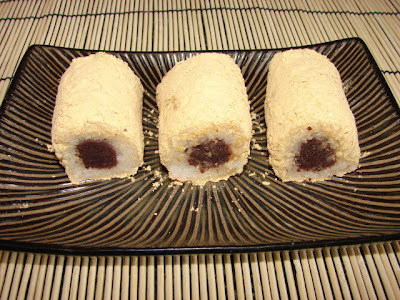 Basically this is a sweet rice roll with aduki bean paste filling and rolled in toasted soya flour. A bit like sushi with a sweet bean filling. A popular sweet cake in Beijing. Many recipes use glutinous flour pastry but I like this one with cooked sticky rice. Wash and soak the rice for few hours. Put the rice in a container, water level should be just on the top of the rice, add sugar and stir. Steam for about 30 - 35 minutes or till cooked through. Leave to cool. Divide the bean paste into two equal portion and roll it into a long thin sausage. Line the working area with a piece of cling film, put half the rice on. Spread it out a bit, then fold the cling film over and spread with fingers till you get a smooth long rectangular block of rice. Put the rolled out bean paste in the middle and roll it up with the help of cling film and shape it like sushi. Press to firm up the roll. Put the roll onto the toasted soy bean flour. Roll and coated then cut the cake into pieces. This cake is best eaten within 1 day or it may be a bit hard. Traditional method is to roast the beans till golden brown then ground to powder. The cheat method I used in the recipe is soya flour, available in Tesco or many other places. Roast the flour in a dry pan in medium low heat, stirring all the time for about 15 minutes till light golden brown, the flour should taste a bit sweet and nutty. See the slide show the colour of unroasted to roasted flour. IMO soya flour is less tasty than the traditional way using roasted beans then ground. **Soya flour has a light sweetness if you like the flour to be sweeter add in some icing sugar after the mixture is cooled. ** If you like the coating to be even more nutty, add in some toasted sesame seeds and blitz with the flour using a mini blender. Toasted soya flour may be an aquired taste if you are not used to it. If you don't like soya flour, you can use finely ground roasted peanut with or without sesame seeds.